The more and more I work here at the park, I continually find myself shoved between the dichotomy of wanting to share my anti-war sentiments while also desiring to display my appreciation for the sacrifice of veterans and current armed services. How does a pacifist tell the story of battle to both peace-lovers and war-mongers alike, day after day? As our 12:30p film was finishing, at about ten ’til 1:00, I walked to the doors of the auditorium to pry them open. As I was lodging the wooden door stop at the base of one of the doors, an older gentlemen came up to me with angst in his step. “Where can I find the flags?” he asked in a hushed voice. “Excuse me?” I replied, not clearly understanding what he was trying to say. Quite beside himself at this point, he continued to explain to me that he was a Korean War Veteran who was 74 years old. He was not happy that, on Armed Forces Day, there were no flags to be found. Consoling him and suggesting that he take a look in our bookstore for a few flags, I led him and his wife to our gift shop. The entire twenty yards from the Visitor Center to the bookstore, I led a tear-strucken veteran and his wife on a search to find 25-cent plastic flags. Inside, with a display of flags in front of us and the description of their meanings shared between us, the old man continued his lamentation. “This is not enough,” he managed between broken sobs. “There used to be parades. There are no more parades. If you ask a child today about all of this, they know nothing.” As the tears continued to roll down his cheeks and past his soggy nose, he declared that every politician should visit Gettysburg to truly understand the essence of their job. His wife chimed into the conversation, adding that they had a son-in-law who had died in Desert Storm; they had lost four members of their family, total, to warfare in the past 30 years. After adding a few additional thank-yous to the conversation, he then looked up at me with changed eyes. “What do you do here?” he asked. The old soldier was pleased. With the tears and nose debris wiped clean of his face, I solemnly walked back to the visitor center with his card in hand. I still don’t believe in war to be our answer to conflict. But on days like that, through encounters like that, I can’t help but be compelled to tell these stories better—to delve even deeper into the events that occurred here on these battlefields and to bring life and honor to those who fought, regardless of their convictions. Because, for this Korean War Veteran, his entire life revolves around the moment he chose to put his life on the line for another. Where are all the flags? In the stores waiting for us to pick them up. In the stories waiting for us to tell them. 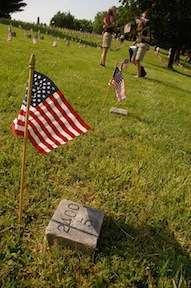 This entry was posted in Battlefields & Historic Places, Memory, National Park Service. Bookmark the permalink. 10 Responses to Where Are All the Flags? This was one of my favorite stories from you from the summer. What a poignant experience it was. Thank you, Chris, for being an eager listener to hear me rattle as I initially processed this experience. You are not alone with your anti-war sentiment and the desire to honor those who chose to go to war. In the late1960s – early70s, I was a college student- virulently against the Vietnam war. I was at every anti-war rally, I cut classes to hand out anti-war literature and to engage people in a dialogue about the war. yet, my father was a WWII Vet. I knew his story, but to me it was “ancient” history as the lives of those who had young and full lives before we were even born, often is to a young person. The college alums had a monument created on campus to honor their veterans of that war, as well as those who came home and built a new life, much of the imagery was taken from artifacts and photos in our collections. I will honor them today, and continue to honor them and all service members as I continue to tell their stories. Thanks for sharing your story– It’s heartwarming to know my dilemma was not only mine. A tremendous “thank you” to you, Nancy, for sharing not only your story to this piece, but for sharing your thoughts your as well. What an incredible testament you bring filled with conviction and honesty and yet with an earnest to connect with the souls that make-up this despised act. Time and time again, as I continued to ask myself “how do I, a peace-activist, connect to these stories of war,” I found the answers, like you did, in the individual stories. It was when I chose to connect to the long-passed individuals that I was able to be grateful for their service. What a lovely set of exhibits you have put together – it is through stories like these, as well as the ones that you and I have recounted, that better understanding comes about. Thank you for your conviction. Interesting story. Maybe it was a slip of the pen, but I think you mischaracterize them when you say “war-mongers”. Thanks, Maxwell. While the word “war-mongers” might in fact seem a little harsh and perhaps a “slip of the pen,” I was simply using that word to characterize the polar opposite of “peace lovers.” By no means am I describing people who might not align themselves with radical acts of peace to automatically be one who is hungry for war. I understand that between those two characteristics there are many that draw a bit of correlation to both. As a former NPS seasonal at a Civil War Battlefield myself, let me just say “good on ya” for such a well-written post. I too, am proud that I was a storyteller for my country. I think EVERY NPS employee, especially those who don’t wear the uniform and deal with the public on a daily basis, should be required to read this post as a way to remind them what the mission of NPS really is. Thank you, TJ! As a Seasonal, I found that while the storytelling had the opportunity to connect with a broader audience, it was through interactions such as this that the amalgamation of multiple stories, both old and new alike, began to take place. By having old stories stir up more recent ones, for the historic and current to dialogue with one another, was where the American story, and our duty to remember it, really began to shine. I am sure you will pleasantly remember (most of!) your Seasonal days for years to come. Wars are fought on the basis of many and varied rationales–some more valid than others. Government leaders may engage in it for geo-political reasons, but the average soldier does so for a personal conviction in a belief system that is often pure and unselfish. Some of us may feel that such convictions are wrong because they foster the goals of a political rationale with which we disagree. Others may find that the convictions are simply naive in this modern age or that all wars are unnecessary. But we can all agree that to sacrifice one’s life for one’s conviction, regardless of own feelings about the political issues, is the most sublime element of human existence. That is why we honor the individual soldiers, today and in the past, both North and South, regardless of what political or economic system they might have been fighting for. 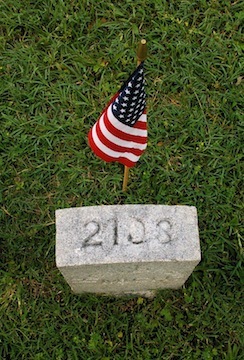 It is no contradiction to say that while one might abhor war generally or disapprove with the rationale behind it, that individual must still respect the courage and conviction of any human being who, for whatever reason, is willing to sacrifice his/her life for an ideal beyond their own physical welfare. That is why we honor them today on Veteran’s Day and every day. Thanks, Frank. I am grateful for the chance to recognize this conviction and to, further, nationally honor such an action.